Today's Nanos poll contains more bad news for the NDP: it is below 25% nationally. The Liberals have continued to trend up. The start of strategic shifting? NDP's forceful opposition to TPP alienating centrists? Or simply the negative coverage generated by the bad buzz surrounding NDP trends? Nanos still has the NDP at 33% in Québec. 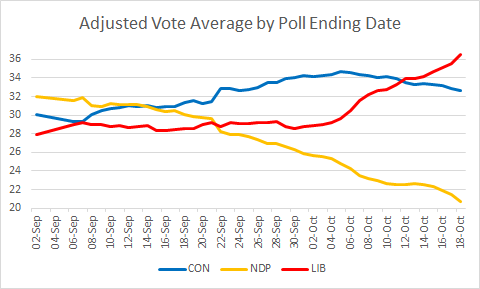 But this is actually the NDP's lowest point there - Nanos just had it higher than other polls in the past few days. It remains to be seen whether the NDP's down trend in Québec has continued since Friday's TVA debate, but this first bit of data should be dispiriting to NDP supporters. 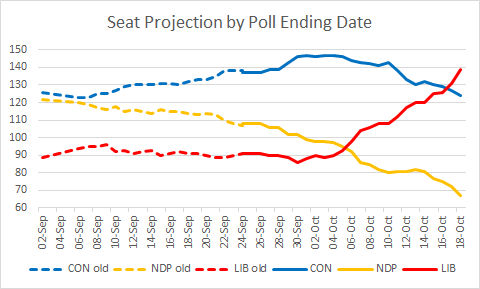 The model is being, well, conservative: it's basically waiting for other pollsters to confirm the continued NDP slide before penalizing it more heavily. Make no mistake, though: the risks for the NDP are highly asymmetric at this point. 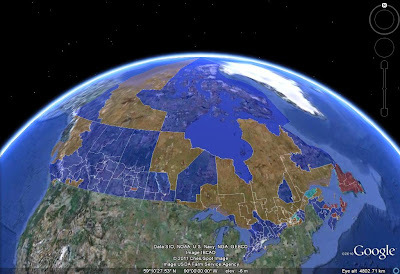 At 32% in Québec, it is projected to win 49 seats. With Léger's numbers, where the NDP was at 28%, that seat count drops to 30. It's 4-5 seats per point in Québec alone! So running simulations and taking an average (as opposed to just projecting using a poll average, as I'm doing) would knock the NDP down several seats, making it already virtually tied with the Liberals.